On Feb. 23, the Catholic Church remembers the life and martyrdom of St. Polycarp, a disciple of the apostle and evangelist St. John. 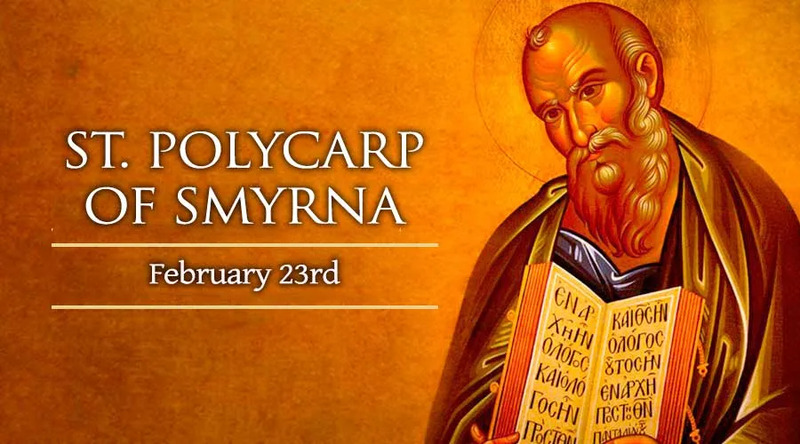 Polycarp is celebrated on the same date by Eastern Orthodox Christians, who also honor him as a Saint. Polycarp is known to later generations primarily through the account of his martyrdom, rather than by a formal biography. However, it can be determined from that account that he was born around the year 69 AD. From the testimony he gave to his persecutors – stating he had served Christ for 86 years – it is clear that he was either raised as a Christian, or became one in his youth. Growing up among the Greek-speaking Christians of the Roman Empire, Polycarp received the teachings and recollections of individuals who had seen and known Jesus during his earthly life. This important connection – between Jesus' first disciples and apostles and their respective students – served to protect the Catholic Church against the influence of heresy during its earliest days, particularly against early attempts to deny Jesus' bodily incarnation and full humanity. Polycarp's most significant teacher, with whom he studied personally, was St. John – whose contributions to the Bible included not only the clearest indication of Jesus' eternal divinity, but also the strongest assertions of the human nature he assumed on behalf of mankind. By contrast, certain tendencies had already emerged among the first Christians – to deny the reality of Jesus' literal suffering, death, and resurrection, regarding them as mere "symbols" of highly abstract ideas. Another Catholic teacher of the second century, St. Irenaeus, wrote that Polycarp "was not only instructed by apostles, and conversed with many who had seen Christ; but he was also, by apostles, appointed bishop of the Church in Smyrna." In a surviving letter that he wrote to the Philippians, he reminded that Church – which had also received the teaching of St. Paul – not to surrender their faith to the "gnostic" teachers claiming to teach a more intellectually refined gospel. "For every one who shall not confess that Jesus Christ is come in the flesh, is antichrist," he wrote – citing St. John himself – "and whosoever shall not confess the testimony of the Cross, is of the devil; and whosoever shall pervert the oracles of the Lord to his own lusts and say that there is neither resurrection nor judgment, that man is the firstborn of Satan." "Let us therefore, without ceasing, hold fast by our hope and by the pledge of our righteousness," Polycarp taught – as he went on to explain that both hope and righteousness depended upon "Jesus Christ, who took up our sins in His own body upon the cross." With eloquence and clarity, he reminded the Philippian Church that Christ, "for our sakes, endured all things – so that we might live in him." However, Polycarp's most eloquent testimony to his faith in Jesus came not through his words, but through his martyrdom, described in another early Christian work. The Church of Smyrna, in present-day Turkey, compiled their recollections of their bishop's death at the hands of public authorities in a letter to another local church. "We have written to you, brethren, as to what relates to the martyrs, and especially to the blessed Polycarp" – who, in the words of the Catholics of Smyrna, "put an end to the persecution – having, as it were, set a seal upon it by his martyrdom." Around the year 155, Polycarp became aware that government authorities were on the lookout for him, seeking to stamp out the Catholic Church's claim of obeying a higher authority than the Emperor. He retreated to a country house and occupied himself with constant prayer, before receiving a vision of his death that prompted him to inform his friends: "I must be burned alive." He changed locations, but was betrayed by a young man who knew his whereabouts and confessed under torture. He was captured on a Saturday evening by two public officials, who urged him to submit to the state demands. "What harm is there," one asked, "in saying, 'Caesar is Lord,' and in sacrificing to him, with the other ceremonies observed on such occasions, so as to make sure of safety?" "I shall not do as you advise me," he answered. Outraged by his response, the officials had him violently thrown from their chariot and taken to an arena for execution. Entering the stadium, the bishop – along with some of his companions, who survived to tell of it – heard a heavenly voice, saying: "Be strong, and show yourself a man, O Polycarp!" Before the crowd, the Roman proconsul demanded again that he worship the emperor. "Hear me declare with boldness, I am a Christian," the bishop said. "And if you wish to learn what the doctrines of Christianity are, appoint me a day, and you shall hear them." "You threaten me with fire," he continued "which burns for an hour, and after a little is extinguished. But you are ignorant of the fire of the coming judgment and of eternal punishment, reserved for the ungodly." "But," he challenged the proconsul, "what are you waiting for? Bring forth what you will." Although the crowds clamored for Polycarp to be devoured by beasts, it was decided he should be burned alive, just as he had prophesied. He prayed aloud to God: "May I be accepted this day before you as an acceptable sacrifice -- just as you, the ever-truthful God, have foreordained, revealed beforehand to me, and now have fulfilled." What happened next struck Polycarp's companions with amazement; they recorded the sight in the letter that they circulated after Polycarp's death. "As the flame blazed forth in great fury," they wrote, "we to whom it was given to witness it, beheld a great miracle." The fire did not seem to touch the bishop's body. Rather, as they described, "shaping itself into the form of an arch, it encompassed – as by a circle – the body of the martyr. And he appeared within not like flesh which is burnt, but as bread that is baked, or as gold and silver glowing in a furnace." "Moreover, we perceived such a sweet odour coming from the flames – as if frankincense or some such precious spices had been burning there." The executioners perceived that Polycarp's death was not going as planned. Losing patience, they ordered him to be stabbed to death. From the resulting wound, "there came forth a dove, and a great quantity of blood, so that the fire was extinguished." The crowd, as the Christian witnesses recalled, were understandably amazed. "All the people marveled," they wrote, "that there should be such a difference between the unbelievers and the elect." Polycarp, they proclaimed, had been among that elect – "having in our own times been an apostolic and prophetic teacher, and bishop of the Catholic Church which is in Smyrna." St. Polycarp has been venerated as a Saint since his death in 155.